Along the highest ridge tops of the Southern Appalachians, the Blue Ridge Parkway serves as the gateway to incredible outdoor adventure and breathtaking mountain vistas. The Blue Ridge Parkway is part of the National Park Service and is known as America&apos;s Favorite Scenic Drive. The 469-mile ribbon of road weaves around the peaks of the stunning Blue Ridge Mountains connecting Shenandoah National Park (Virginia) and Great Smoky Mountains National Park (North Carolina). 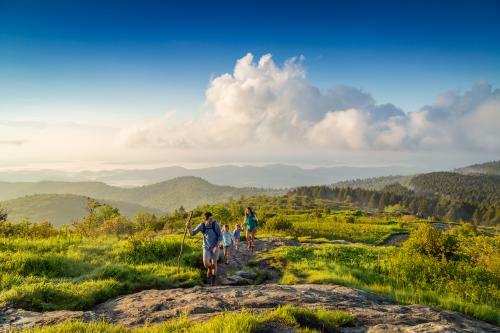 As the Parkway approaches Asheville, it offers breathtaking views of some of the highest peaks east of the Mississippi River and access to the area&apos;s best hiking trails. The Parkway is easy to explore with no admission fee and frequent, paved overlooks. 1. Scenic Drives: The best and easiest way to explore the Blue Ridge Parkway is to go for a drive! Drive for 10 miles or 50—it&apos;s all up to you! And, it&apos;s easy to create an experience that fits with your itinerary of other things to do in Asheville. 2. Hiking: The Blue Ridge Parkway is known for providing access to some of the best hiking trails in the nation. Whether you&apos;re looking for a short, easy hike or a more challenging trek, you&apos;ll find it on the Parkway. The forested trails lead to everything from 360-degree views to thundering waterfalls. See our guide to the best Blue Ridge Parkway hikes. 3. Picnicking: The dramatic views found on the Blue Ridge Parkway make for unforgettable picnic spots. 4. Biking: Bike the Blue Ridge Parkway for an outdoor adventure, and workout, like no other. See our guide to road biking adventures. From natural wonders to an art gallery/shop, these are highlights of the Blue Ridge Parkway near Asheville. Distances from downtown Asheville are shown in parenthesis. COST: It is FREE to drive the Blue Ridge Parkway. There is no admission fee. HOURS: The Blue Ridge Parkway is open 24 hours a day, 7 days a week year-round. However, the Parkway may close due to snow or ice. For real time road information, please see the interactive road closures map on the National Park Service web site. HOW TO NAVIGATE: There are stone markers at every mile along the Blue Ridge Parkway. These numbered mile markers are your guide for locating top attractions and overlooks. SPEED LIMIT: The Blue Ridge Parkway has a speed limit of 45 MPH, making for a leisurely drive. There are many paved overlooks where you can stop to rest, see the view or take photos. GAS: There are no gas stations on the Blue Ridge Parkway. But gas is available just off the Parkway at several major intersections with US or state highways. We recommend filling up your tank before driving on the Parkway. VEHICLES THAT CAN DRIVE THE PARKWAY: All non-commercial vehicles are welcome on the Blue Ridge Parkway. In the Asheville area, there are four main entrances to the Blue Ridge Parkway. There are roadside signs before and at each of these entrances. NC Highway 191 and Blue Ridge Parkway Milepost 393.6: Close by: The North Carolina Arboretum, Asheville Outlets, Interstate 26. 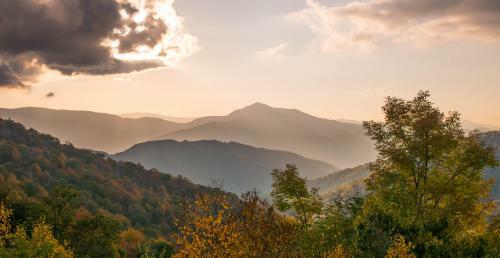 Asheville is home to the Blue Ridge Parkway Visitor Center. Pick up maps, ask questions, see interactive exhibits or purchase a souvenir. The Visitor Center is located at Blue Ridge Parkway Milepost 384. When using a GPS, use the following address: 195 Hemphill Knob Rd., Asheville. Check out our interactive Blue Ridge Parkway travel guide, and learn about the Explorers of the Blue Ridge Parkway. The idea for the Blue Ridge Parkway was born during the Great Depression in the early 1930s when President Franklin Delano Roosevelt visited the newly constructed Skyline Drive in Virginia. 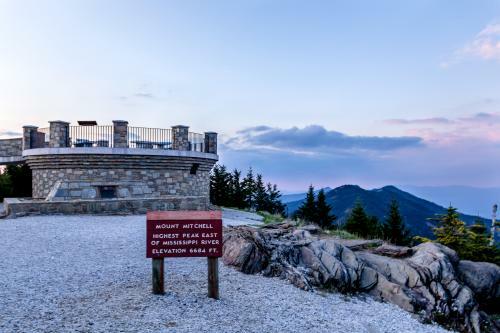 Virginia Senator Harry Byrd suggested the road could be extended to connect with Great Smoky Mountains National Park in North Carolina. In 1933, the Interior Secretary approved the project with a budget of $16 million. After debate over the route, namely whether or not it would go through Asheville, plans were finalized. With architects Gilmore Clark and Stanley Abbot at the helm, construction soon began on September 11, 1935. The architects put a major emphasis on preserving nature and Appalachian culture and history. When World War II began, about 170 miles of the Blue Ridge Parkway had been completed and were open to the public. A 10-year development plan in the 1950s helped spur the remaining construction. And by 1966, all but 7.7 miles of the Parkway (a stretch at Grandfather Mountain, North Carolina) had been finished. To finish the project, the Linn Cove Viaduct was constructed. This engineering feat, a 1,243-foot concrete bridge, was constructed from the top down to limit effects on the natural environment. With the Viaduct in place, the Blue Ridge Parkway was finally complete. The Parkway officially opened on September 11, 1987—exactly 52 after construction began. In the years since, the Blue Ridge Parkway has become the most visited National Park Service site. Dive deeper into the history of the Blue Ridge Parkway, meet the people who paved the way for its creation and see more trip ideas by checking out our interactive Blue Ridge Parkway travel guide: Explorers of the Blue Ridge Parkway.